Bellator 181 took place Friday night from WinStar World Casino in Thackerville, Okla. The main event featured lightweights Brandon Girtz and Derek Campos in a catchweight rubber match. Campos won their first meeting by decision in 2013. Girtz KO’d Campos in their rematch in 2015. 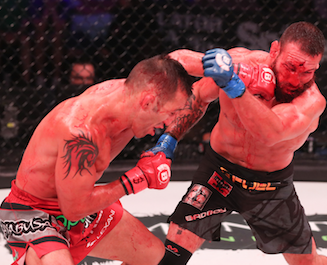 But it was Campos who got the TKO victory via doctor stoppage at Bellator 181 after Girtz suffered a massive cut on his forehead. In the co-headliner middleweight standout John Salter picked up his sixth straight stoppage victory with a first-round submission of fellow UFC vet Kendall Grove.